Chilli rating - mild - 1. Suitable for vegetarians. Old El Paso Beans and Jalapenos add a crunchy texture to your Old El Paso Mexican meal Jalapenos will add a hint of spice that will give your meal a real kick! 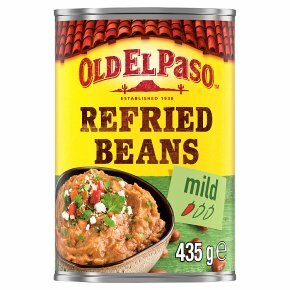 Why not try Old El Paso Refried beans in your fajita wrap or burrito to add an extra layer of delicious texture to your Mexican meal! Since 1938 Old El Paso? has been bringing the vibrant flavours of Mexico to your table. A blend of hearty, Mexican style Pinto beans with a hint of onions, our Refried Beans are delicious enjoyed with any Mexican meal. Simply heat, spoon over and tuck in!